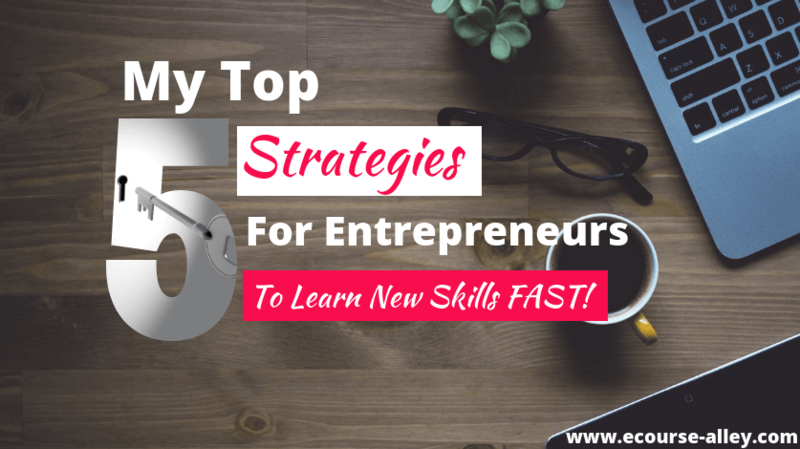 Home » Building Your Skillset » My Top 5 Strategies for Entrepreneurs to Learn New Skills Fast! We all know life moves at a very fast pace these days, and for entrepreneurs, this can be very challenging. Trying to keep up with changing technology, software updates, and things like GDPR. Life as an online entrepreneur can be overwhelming! 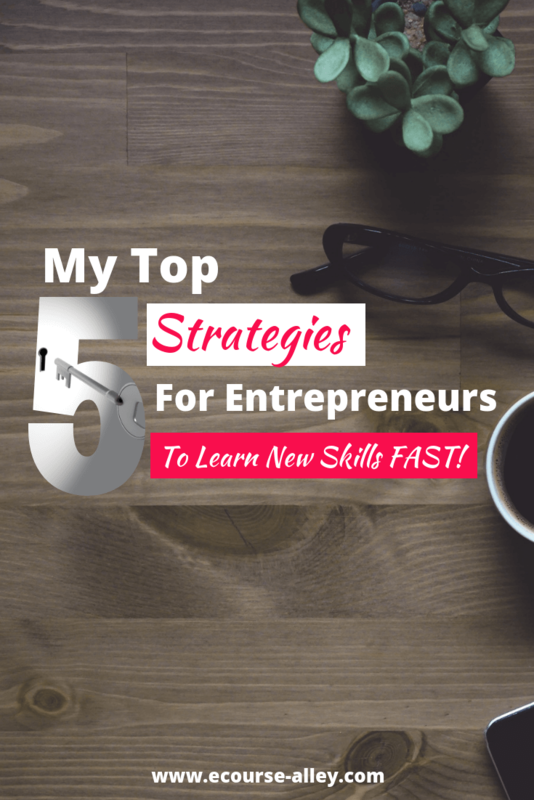 So today I’m going to share with you my top 5 strategies for entrepreneurs to learn new skills fast! Whether you are new to starting a business online or are trying to grow your online business, you need to juggle many different aspects in order to succeed. You need to learn new skills when you need them and learn them well – and fast! Everyone learns in different ways, of course, so these strategies may not work for everyone. However, I believe that most people will agree that looking for ways to absorb information faster is essential when running and ramping up a business. You have to be a “Jack of all Trades” and excel in most, if not all, areas for your business to be a success. Now you could outsource skills that you don’t have. But for today’s post I’m going to focus on how you as a solopreneur can learn new things when you need them. Something that is also coined, “just in time” learning. In 5th Place is reading. Read as much as you can about your topic. Look at competitor’s or business influencer’s blogs, articles, websites, etc. Listen to their podcasts too. Just remember that you want to put actionable things that you learn into practice right away. So try not to get into a habit of just reading and reading without doing! This is a key strategy to learn new skills. In the e-learning field, I read blog posts by a variety of authors and business professionals. For example, blog posts by eLearning Industry, eLearning Brothers, Thinkific, Udemy, and The eLearning Guild, to name a few. Feedspot is a website that lists blogs. Here is a list of 100 e-learning blogs for you to check out. In terms of marketing and other business-related information, I consult websites such as, Neil Patel, Smart Passive Income, Melyssa Griffin, HubSpot, and Yoast. In 4th Place is watching YouTube videos of successful entrepreneurs in your niche. Focus on a few of the top performers so as to avoid information overload. Try to watch videos that are relevant to you right now so you don’t get overwhelmed. I mean, if you were learning yoga for the first time, you wouldn’t start with advanced yoga videos. So, start at the beginning and don’t look ahead until you are there. Until you need to know something. This is another important strategy to learn new skills! Subscribe to the channels that help you the most so you can get updates when they post new videos. Here are some YouTube channels that I find helpful in the world of online entrepreneurs and e-course entrepreneurs: Thinkific, eLearning Brothers, Neil Patel, Smart Passive Income, Entrepreneur, Sunny Lenarduzzi, and DottoTech. In 3rd Place is to attend webinars of successful entrepreneurs/business influencers in your niche. I put this strategy, to learn new skills fast, in third place because watching, listening and participating in presentations is similar to taking an accelerated course on the topic. So, you can learn something new in a short period of time. Plus, presenters normally give you a “freebie” at the end of the presentation. This freebie proves to be very useful and is usually something you can’t find online easily. Or, it is something that they only share with their subscribers and people who attend their webinars. To name a few, I’ve attended marketing webinars by Neil Patel, online course webinars by Teachable, Thinkific, Udemy, and Mirasee, and webinars geared towards online entrepreneurs and building passive income, by business influencers like Melyssa Griffin and Pat Flynn. In 2nd Place is getting assistance directly from successful entrepreneurs in your field. This is another key strategy to learn new skills because you can get right at the root of a problem you are having or a hurdle you are trying to overcome. One way to get help is to join Facebook groups associated with your online business. Once you have joined, start asking questions and learn all that you can from the experiences of others. For example, if you are creating an online course on Udemy, Thinkific or Teachable, join their instructor Facebook groups. It is free and it is the best way to learn the skills you need to create and market a successful course on these platforms. Or, sign up with a business coach or someone who is offering their services as a consultant to help you learn new skills fast. In 1st Place is to learn by doing. Above all, the best and fastest way to learn a new skill that you need to help you with your online business journey is to just dive in and take action. Even if you feel you aren’t quite ready, you can learn what you need as you go along. If your dream is to build and sell online courses, for example, then make a demo course to help you learn various authoring tool software programs. This last and most useful strategy leads me to what we are doing here at e-course ally right now and maybe why we’ve been a bit MIA this last little while. We’ve been starting up a “Learn by Doing” series of online courses. Now, these aren’t your typical “click and reveal” types of online courses. This series of courses on topics relevant to online course creation and online business, will walk learners through various aspects of course creation, software mastery and business tactics slowly and step-by-step. Instead of just describing techniques and explaining processes, you will actually work along with me to build courses and other aspects of being an online entrepreneur. If we receive positive feedback from our first Learn by Doing course, it will help propel us further to continue on with this method of teaching people online. The first course in this series will help beginners and intermediate course designers learn Articulate Storyline 3. Note that you don’t have to have purchased the software to learn from this course. You only need the trial version of Storyline. In this course, you will be working along side me to build an Articulate Storyline 3 Course Example in ONE DAY! I take you through the entire process, slide-by-slide, to create this example course. By the end of the course, you will know quite a lot about how to manipulate and successfully use Articulate Storyline 3. Now, this course is at the present moment, still in the development stages. But if you have always wanted to learn Articulate Storyline in a unique and efficient way, then email me at heather@ecourse-alley.com and I will send you a coupon code for 94% off the regular price of the course which you can use when it opens up. Read a lot! Learn from successful entrepreneurs in your niche. Watch YouTube videos relevant to your topic and when you need to learn specific skills. Attend Webinars put on by successful entrepreneurs in areas that you are struggling with at your present stage of business. Get direct help. Join Facebook groups and get to know those who can help you get better. Learn by doing! Don’t wait to start. Start your journey and learn as you go along. Well, that’s all for today. Leave a comment and let me know if you have any other strategies that help you learn new skills fast.